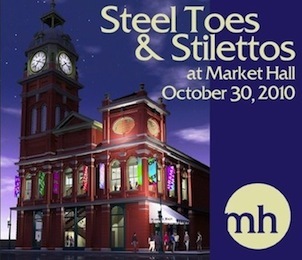 Deets on Market Hall Fundraiser "Steel Toes & Stilettos"
Tickets for the Market Hall fundraiser "Steel Toes and Stilettos" on October 30th are selling out quickly. This is your chance to preview the renovations on this historic theatre with guided tours (steel toes and hard hats will be provided to guests) by the Market Hall staff. As well, the event includes great food and lively entertainment. The fundraiser takes place Saturday, October 30, 2010, at 7 p.m. at The Favourite Greek, 360 George Street North, which is located right below Market Hall. Tickets are $75 per person. For more information, go to their website, call the Market Hall Administration (705) 749-1146 or email events@markethall.org﻿. For info on making a donation to the Market Hall fundraising campaign, click here.